One of the biggest Christian Hiphop artists right now on the scene! 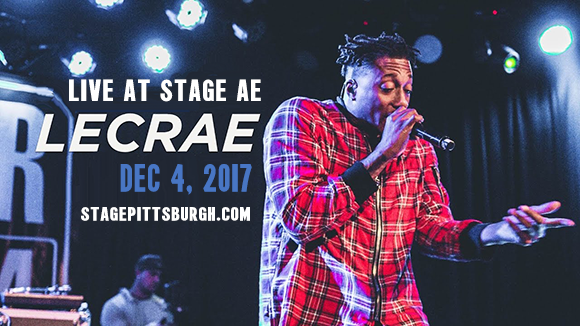 Lecrae is coming LIVE to Stage AE on Monday 4th December 2017! Get ready to catch his performance on the stage as he brings his latest singles and groundbreaking hit anthems to his fans this coming Winter… songs such as "Blessings" which featured Ty Dollar $ign, encourages people to come together and appreciate what you have. If you love his music then this is the place to be ya'll – book your tickets today before the rush as time edges closer and closer to the main night!! Lecrae, is one of the freshest, most current sounding Christian hip hop recording artists, songwriters and producers right now in the music industry, known for his positive outlook on life, he has inspired many through his social aspect of creating and promoting his music. Working as the founder of ReachLife Ministries and of course, writing and showcasing his incredible collection of tracks. From humble beginnings, he has transformed his career, while keeping a genuine and whole hearted approach. Now with seven studio albums and three mixtapes as a solo artist, and has released three studio albums, a remix album, and one EP, there's so much for fans to get their teeth stuck into. And there's more where that came from! 2018 brings yet another exciting year ahead for the Rapper and this Winter tour will no doubt be a great run up to more big things on the horizon… catch him while you can! With Grammy Awards and plenty of other recognition, there's no doubt Lacrae will bring the energy for a sell out tour!